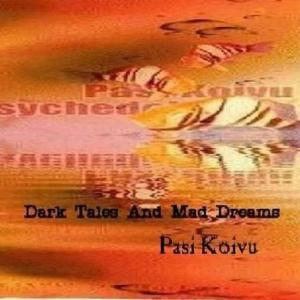 Pasi Koivu is a trained musician from Jyväskylä, central Finland, recently remembered from multi-national group CORVUS STONE. The three albums under his name are completely one-man efforts, this one being the first of them. When sending me the CD's he felt a little ashamed of these experimentations and thought that he has matured a lot as a musician from those times. 'Madman's Dream' has a jazzy vibe which is in a rather rude contrast with the angular and rough-edged synthetic sound. A jazz group would make a nice performance from that composition, but this frankly isn't very pleasing to ears. 'Ghost Forest' is rockier, and again the noisy soundscape is its weakness. "Pasi uses KORG M50 keyboard", we are informed. I'm generally not very good at telling the programmed sounds from real instruments, but here the overall sound is often bad, in whatever way it is produced. If a band-like sound is attempted, it would be a good idea to use real musicians playing real instruments instead of phoney programmed sounds. 'Sombrero' is a crafty little composition and the more delicate moments with the keyboard playing solo are all right, but a certain sense of half- baked sound is present. The sound is the problem almost throughout the album, being extremely far from polished Electronic Music professionalism. (I deeply enjoy that genre and I am a bit disappointed that this album seems to pretend being something that it isn't. As a many-sided and surpriseful composer Pasi shows unquestionable potential here, but the way those compositions are represented is immature. Therefore this music leaves me cold emotionally. I could name another Finnish keyboard-centred one-man project whose music works a whole lot better. I'm speaking of OZONE PLAYER, ie. Otso Pakarinen (a worthy addition to PA perhaps?). 'Also Starring' has a nice jazz groove, and joyful 'Space Party' is indeed aptly titled. Brief 'Jester Doll' is the calmest and prettiest tune. The pointlessly long (67 min 39 sec) album could have been improved also by some further choosing and editing of material (actually I said the same about Corvus Stone), but much more by using more musicians. Hopefully the two later albums sound a bit better.